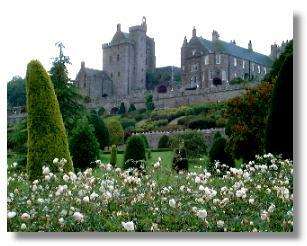 First impressions are often important and visitors to Drummond Castle Gardens in Perthshire are certainly bowled over before they even arrive. There is a very long, straight, single-track driveway, lined with tall beech trees, which is the access from the main A9 to Crieff road. The trees seem to go on forever, though it is actually only just over a mile long - with 307 trees on each side of the narrow avenue. Noting the time passing swiftly by. Clearly time flying by is not a modern phenomenon! Of course, over the centuries, the garden has been remodelled several times. The 4th Earl Drummond was a well known agricultural improver at the end of the 17th century - he had a plan to grow an avenue of trees all the way from Drummond Castle to Perth - twenty miles away! The 4th Earl employed a gardener, John Reid, who later wrote "The Scots Gard'ner" which was the first Scottish book on the subject (in 1683) and it claimed that it was "published for the climate of Scotland". 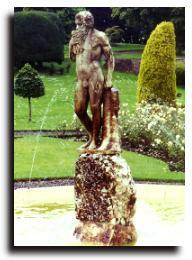 Fountains and statues (such as the one here) became a feature of the garden in the 18th century. Involvement of the family in the Jacobite Uprisings interrupted maintenance but early in the 19th century Lewis Kennedy (who had previously worked for the Empress Josephine at Malmaison in France) was engaged as Factor for the estate. 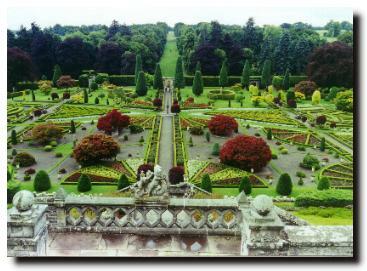 It was Kennedy who created a formal flower garden and paintings of the Drummonds at that time show something of what it looked like (the family were often painted with the gardens as background). A later design by George Penrose Kennedy (Lewis's son) was prepared in 1838 and when Queen Victoria and Prince Albert visited the Drummonds in 1842, it was this layout which she saw. It is broadly this plan which is in place today, though with wider range of plant types (thanks to the many Victorian plant hunters). But early photographs show a much greater number of plants growing closely together. In addition to the formal gardens in front of the castle and mansion, there is a kitchen garden and a hothouse beyond a boundary wall. 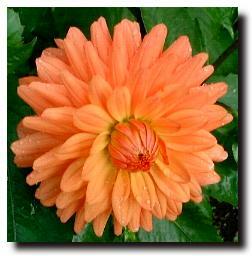 It was in this area that the picture of the dahlia above was taken. King James IV gave the first Lord Drummond permission to build a stronghold on a rocky outcrop on the edge of Strathearn in 1490. 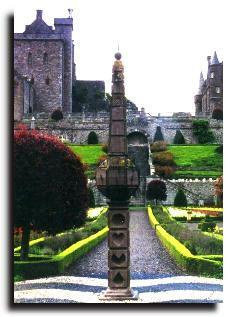 The Drummonds were already a major family in Scotland and that status was to grow over the coming centuries. As was usually the case, the original tower keep was modified and enlarged but the lower floors are those built by the first Lord Drummond. In 1605, King James VI (now king of England as well as Scotland), promoted the 4th Lord Drummond to be the first Earl of Perth. It was the first Earl who is credited with transforming the gardens and castle in the 1630s. The architect, John Mylne III was King Charles I's master mason (and he was also responsible for the magnificent obelisk sundial noted above). Cromwell destroyed the keep during the Civil War but, towards the end of the 17th century, the 4th Earl of Perth built a mansion house which created an inner courtyard (see the building on the right of the picture above). He also enhanced the gardens and the extensive Drummond estates. During the Jacobite Uprisings, the Drummonds supported Jacobite cause and joined the Earl of Mar in 1715 and Bonnie Prince Charlie in 1745. 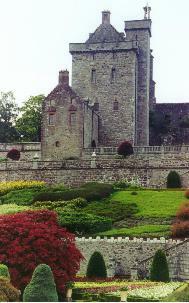 In order to avoid having government troops billeted in the keep during the '45, the Duchess of Perth had it destroyed. The keep was repaired in 1822. Apart from a small ticket office in the keep, none of the buildings are open to the public. A guide book is available in the ticket office - but not much else. With the large number of visitors to the gardens, it is surprising that there are not better catering facilities. That aside, there is plenty for visitors to the gardens to admire.